Aparna Nori documents the dying art of handmade bread-making in Goa. On my first visit to Goa 20 years ago, I remember being woken up in the morning by a curious ‘poink-poink’ sound. A walk down the village road following the sound led to my discovery of the Poder, the local baker. Goan community is traditionally rice based and the practice of eating local Goan favorites like Xacuti and Sorpotel with freshly baked bread started only in the early 17th century. The Portuguese Jesuit priests, introduced a few families of the Chaddo community in the Salcete region, to the art of leavened bread and the profession since then passed down generations, across to families from other communities as well. I spent a few days in search of bakeries that still bake the traditional way. There are few left, struggling to keep them working. Many converted to selling machine based bread or sold their businesses to non Goan families and migrated in search of opportunities elsewhere. But for the moment the ‘poink-poink’ of the poder’s cycle horn continues to be a familiar sound, at least in the small villages. The aroma of the freshly baked flat pita like poie, scissored and butterfly shaped katriche pao, soft and chewy pao, hard and bangle shaped kankana welcomes me each time I visit, and evokes a feeling of home. The bakeries are a part of the main house where the family lives. Most are dark and dinghy spaces with every inch covered by soot and dough. The heat of the oven is overwhelming, but work continues without a break for 3-4 hours, till all the different breads are done. 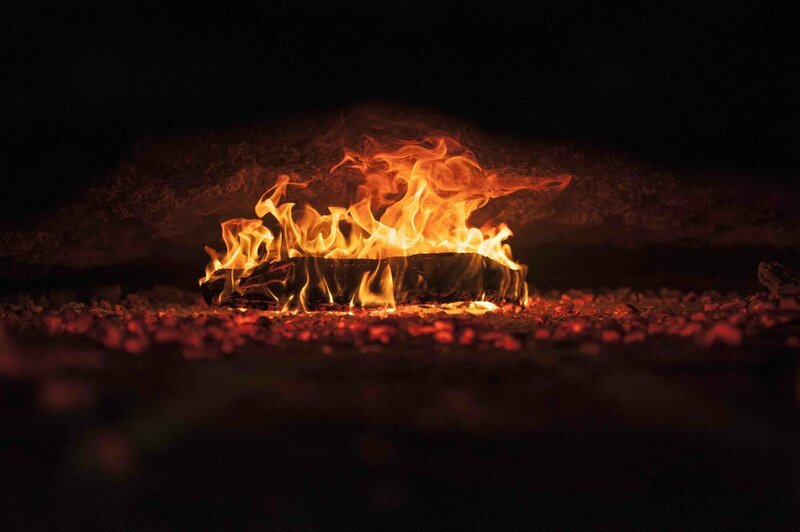 The oven, called the forn is laid by hand, layer by layer using sand, stones and glass and packed outside with clay. The cavity inside is lined with stone tiles and laterite to keep high temperatures and also to retain optimum heat. Typically dried hard wood like tamarind or jamun is used. The burning coal is spread out time to time with a wooden spatula to make sure that all corners of the oven are heated evenly. The poder rolls out the mixed dough by hand onto a large platform to allow it to rest and rise. The proportion of yeast, flour and water is carefully monitored based on seasonality to ensure perfectly rolled dough everyday. In the earlier days, toddy was used to ferment the dough which gave the Goan bread its unique flavor, texture, aroma and identity. It’s hard to find toddy tappers in the Goan villages, so the bakers today use commercial yeast to prep the dough. The rested dough is beaten out by hand to remove air and is left to rest some more which helps the bread to rise perfectly in the oven. Hand rolled undho pao, rest on the trays for an hour allowing it to rise. These are specially made for diabetics and popular at dinner time. The balls of dough are hand rolled in bran, and once baked form a pocket within much like pita bread. With a slight sourness, the poie bread is the most popular, with some bakeries making around 500-700 a day. The bread is baked twice a day in the forn. Different breads need different temperatures to bake perfectly. The poie is baked first at the highest temperature, and then the katriche pao, regular pao and last to go in are kankana which are hard and crisp. Kankana, (named so because of its bangle shape) a traditional bread eaten with evening tea is baked last in the forn. It is kept inside in lower heat for a longer time giving it a hard, crusty texture. Locals eat the kankanas by softening it in a cup of hot tea. Although owing to factory made biscuits the practice is lesser now, a few older bakeries like this still bake a small batch everyday. Freshly baked, warm poies make their way into the poder’s basket ready for delivery. Warm poie and katriche pao, fresh out of the oven are lined up for sale. Most bakeries are family run businesses. Joe, a third generation baker, manages the bakery along with his father, taking care of stocks, shift timings and occasionally stepping in to manage the oven when they are short staffed. The traditional forn is often embellished with religious motifs out of respect for the source of livelihood. Traditionally, baking has been handed down through generations of Christian families, although there are a few Hindu families who have taken over the businesses over time. Wooden and metal spatulas neatly line up in the bakery ready for the next batch of baking. Tin trays called the fornas are used to bake the pao bread twice a day. Different breads need different temperatures to bake perfectly. The poie is baked first at the highest temperature, and then the katriche pao, regular pao and last to go in are kankana which are hard and crisp. The poder (a word derived from Portuguese padeiro) starts the day before sunrise to bake the first batch of bread. He then heads out to deliver the bread on a cycle honking along, once at breakfast and again before dinner time. Photos and words by Aparna Nori.